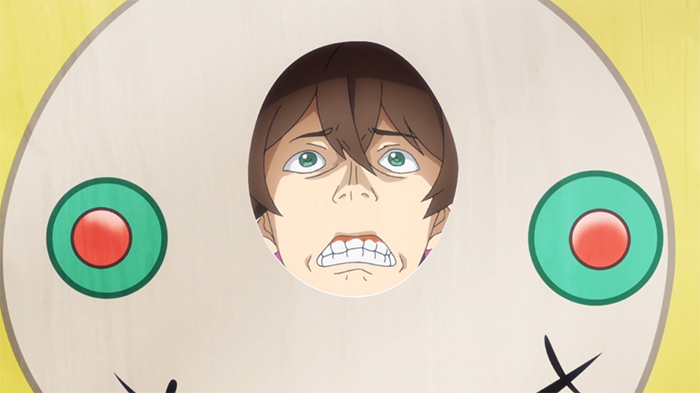 My frustration with Dogakobo grows as other shows like SNAFU and Arslan quietly do their thing and do it well. Maybe I chose the wrong shows this season? Also, My Love Story MIGHT have a lawsuit on their hands after stealing the Rocky training montage music. Jel: *Sigh* This just keeps getting worse and worse. I want to say this was a filler episode but I’m more worried they’ve run out of content altogether. I mean the entire thing was Eruna talking about a very specific seating position and the drama club planning a surprise party. Not HAVING the party mind you, mostly just the planning. There was one decent joke tapping into Calligraphy Girl’s dark sense of humor and I found it kind of hilarious that Seisa can just say “Killing Art” and murder a thunderstorm, but other than that there wasn’t much good to say about this episode. Artemis: The last couple of episodes of My Love Story have felt just a tiny bit off for me, but this week’s put that goofy smile right back on my face. It didn’t really lend any further depth to Takeo and Yamato’s relationship, or even touch upon anything about any of the characters that we didn’t already know, but it was dorky and light-hearted and as adorable as ever. The dramatic 80s-style training montage, complete with epic music and a kind of narration via Takeo’s and Yamato’s emails to each other, made me laugh outright – this is exactly the kind of ridiculous earnestness that makes My Love Story so fun to watch each week. Marlin: There’s just so much to love about this episode it’s hard to say where I should start first. While I wish the main pair would have gotten a bit less sheepish after last episode, I’m still fine with them being adorable dorks. Takeo’s commitment to people is on display this week, as he helps out a club in his favorite sport. I like how they emphasize that Takeo is valued for his strength, both strength of character and physical strength. The upperclassmen don’t shy away from asking him for help even though he’s a freshman because they can see that. That montage was certainly something. 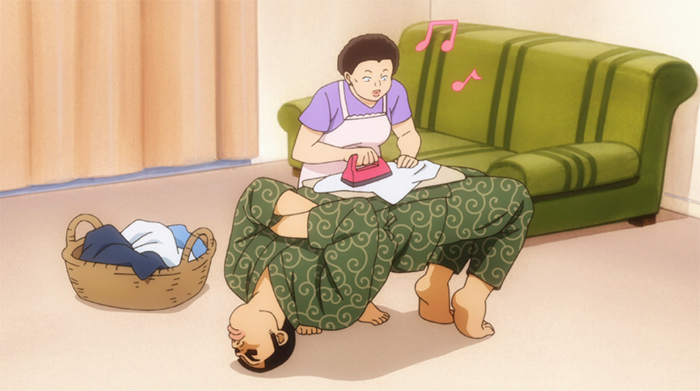 (Not)Gonna Fly Now playing while Yamada and Takeo’s text conversations scroll past was absolutely adorable. Suna also steals the show as the voice of reason, showing simple misunderstandings for exactly what they are. It’s almost like OreMono is out to lampoon every misunderstanding stereotype so that Suna can just say “Nah, bro, it’s cool.” He is the best. Gee: Ninja Slayer takes us into the world of its weak and downtrodden, as we view it mostly from the perspective of some guy who got into a horrible accident and then is forced to get a horrendously overblown robot arm, basically tying him into economic servitude to his unlicensed cybernetic doctor. And then the bad guys stage workers’ rebellion against a defiant tofu factory? Everything I just typed out was said word for word in this episode so don’t look at me like that. Overall, it’s nice to see Ninja Slayer go back to being Ninja Slayer instead of focusing on shoddy attempts at drama. With Yamoto and Ninja Slayer finally meeting though, I have a feeling we might get some more “narrative” episodes down the line. Marlin: This show is starting to get boring. You’d think that’d be a weird complaint to give to a moe show, but there is still a difference. There’s being fluff moe, and then there’s being straight up boring. It’s hard to watch this much more knowing that nothing is really gonna happen. My Love Story already fills the warm fuzzies quota by itself and it actually has its main characters going out, so if it doesn’t shape up I might drop it even this late in the game. Marlin: Is this show actually introducing the possibility of Hachiman being attracted to someone outside of the main pair? I might be jumping the gun on this arc, but while Iroha has been making fun of him a lot for flirting with him, just the act of carrying her bags and waiting around for her speaks volumes for a guy who normally shuns everyone around him. I’m not sure what exactly this other school’s endgame is, but it almost seems to me that they’re obfuscating everything with the express purpose of washing their hands of any wrongdoing while making Hachiman’s school look incompetent. I’m not sure why they would possibly want that, but they certainly seem to be acting with the express interest of eating up as much time as possible while giving them all the work. I don’t see how this ends with anything other than Iroha’s resignation, she’s just obviously the wrong person for the job. Jel: We really are just going through the motions at this point. It’s not surprising at all that Tsukasa would move things along with Isla once he found out how little time she has remaining, and this just led into a super predictable sequence of “Anime First Date” events that left me struggling to stay awake. The real clincher was Not Asuka Michiru literally saying “It’s not like I’m doing this for you or anything…”, even if it was in her head and probably meant as a self aware joke. Way to avoid those anime clichés! When Tsukasa passed out for a second I thought they might try a reversal and make HIM the one who was going to die soon, which would have been so hilariously over the top it would have at least been entertaining. Sadly that doesn’t seem to be the case, and I’m going to assume Plastic Memories will continue down the path it set for itself with no deviation. Marlin: Arslan continues to show a lot of great execution. I enjoy stories that show the tensions that clash when an invading army wins. It’s a little weird that Narsus is such a good strategist he knows Karlan’s exact moves, but we’ll just chalk that up to anime loving when rival tacticians predict what the other will do. It seems we might finally see some of the mystical aspects of the show that were hinted in the premise. Considering we now have a priestess coming into the mix, I imagine we’ll see more of that influence once she finds Arslan. Considering Gieve had already been shown to be more than capable with a bow just a few episodes ago, it seemed strange that that was her skill-set. I suppose cavalry archery is a more difficult martial art, but it makes me think there must be more to her than what she’s shown so far. 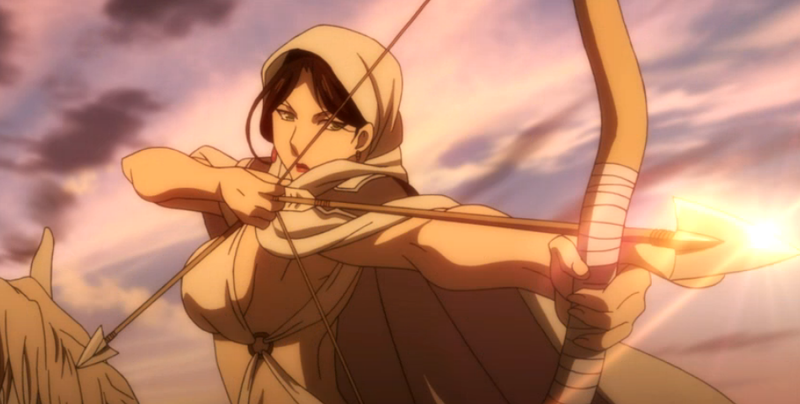 Artemis: One of the great things about Arslan is that there’s a fairly large and varied cast, all with their own colourful pasts, separate agendas, and divergent storylines. And one of the potential downfalls of Arslan is that there’s a fairly large and varied cast, all with their own colourful pasts, separate agendas, and divergent storylines. Put together, are they perhaps too numerous for the show to juggle efficiently? We get tantalizing glimpses of all of them each week, but not enough to be able to piece together the larger picture or satisfy my curiosity. Of course, the fact that I’m this curious to begin with speaks well of Arslan’s general storytelling. True to form, this latest episode revealed some extremely interesting tidbits about Queen Tahamine and her relationship with Andragoras III, but did so in the space of only a couple of minutes, and in the form of unreliable gossip at that. Meanwhile, hardly any time was spent in furthering Arslan’s own role in the story – although if the preview for the next episode is any indication, we can expect to see more on that side of things shortly.